Single Leg Kick on the mat is fantastic for getting you connected to your seat and your back. But it’s also one of the most misunderstood exercises. Warning: If you have lower back issues, keep stomach pulling up or rest head down. If knee issues, separate knees slightly. If there is one exercise in a Mat class that students wonder why we do it, it's the Single Leg Kick! This exercise is so essential to the Pilates method and yet, because it's easy to make it look like you are doing it right, you can actually be doing it and doing nothing at all! 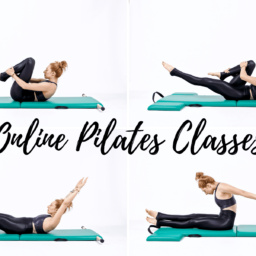 Pilates is never about the choreography but rather about connecting to the body. If you are fully connected, this exercise is a booty and hamstring killer. If you are not connected, you may feel things in your knees or lower back, or nothing at all. Kick your heel to your seat two times without dropping your thigh. Prop yourself on your forearms with your arms parallel to each other fists pressing into your mat. Pull your chest forward and your shoulders back. It's easy to hang in your lower back. Lift your stomach off the mat and reach your tailbone towards your heels to help your lower abdominals connect and lift off the mat. Without letting go of anything kick your right heel to your seat two times. Then press your leg down and switch. Repeat 3-5x each side. As you do this exercise it's easy to let the hips fall side to side and avoid the stretch of the hips. But, if you can work the control and maybe even reduce your range of motion you will get more stretch and strength from each kick. Another thing to notice is where your knee is in space. For me, my knees are not touching the mat when my legs are straight. So, when I kick my heel to my seat my knee doesn't get to drop down and touch the mat. It has to stay where it is. This requires the muscles of my thigh to activate and hold the thigh bone in place as I kick and straighten. You'll know when you are doing it "right." You're seat and hamstrings will speak to you!